The summit was sponsored by IFB, global leader in home appliances and Valuence training and Research Pvt. Ltd., a knowledge services provider company. We were also fortunate to have Prof. S. P. Gupta, Deputy Director of IIT Roorkee, with us. The event started with the lighting of the lamp by the dignitaries and a welcome note by Dr. Santosh Rangnekar, Head of the Department. Dr. Rangnekar emphasized the need to develop oneself in entirety. He talked about the multitude of clubs which department has and the various summits which they have conducted. 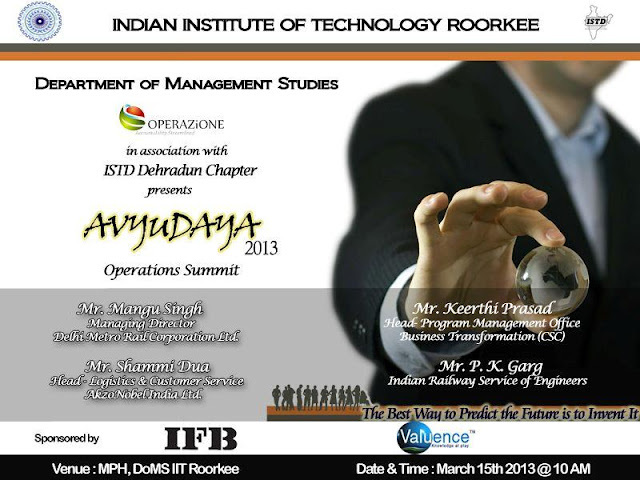 This was followed by the introduction regarding the theme of event by Dr. Rajat Agrawal. He started on the need and importance of operations in the corporate sector, industry, country etc. He highlighted how countries like Japan and China utilized operations to emerge victorious in the present coeval world. After his insightful lecture, the dais was taken over by Mr. Mangu Singh, MD - DMRC. He dealt mostly with issues such as PPP, DMRC construction issues and Carbon Credit. He explicitly stated the importance of the public sector in building organization like DMRC. He said though PPP is a very novel concept but highlighted that PPP in Rapid transport like India has not achieved much success. The challenges which the corporations face are mainly financing, land, and resource constraints. He further highlighted how DMRC is earning carbon credit by saving on energy consumption. An interesting question was raised by a student whether it will be possible to replicate DMRC in Indian railway. To this, Mr. Mangu Singh answered that it is easy to build a great organization when you are building it from scratch. He cited DMRC as an example. Finally he explained supply chain of paint. During the session a student raised an important question regarding current scenario. As the economy is not growing as anticipated, so what is the role of SCM in the current times. The speaker aptly responded that one has to be more aggressive in an economic slowdown. The CEO would like to conserve cash which will reduce the inventory as well as operational cost. After the enriching session, the next speaker was Mr. P. K. Garg. His session was enthralling as he spoke from the heart. He taught the difference between “My world” and “The world”. He also emphasized on the need to know your heart and pursue your dreams. He gave his own example how he wanted to become a professor but he joined railways. He even gave a reference of Steve Jobs, who is a college dropout. Finally he concluded by saying that do whatever you want that makes you happy. The final speaker was Mr Keerthi Prasad. He started by highlighting the importance of business model and its effect on the cloud computing. He explained the concept of platform servers etc. Further he talked about Google war and concluded by highlighting that cloud is going to be the future. The event was further charmed with the presence of Mr. Manoj Sadavarte, Location Head – Godrej & Boyce Mfg. Co. Ltd. H also shared his understanding on various contemporary issues and topics. His session was very much enjoyed by student community. He encouraged students to actively engage in industry projects and learn about real business environment. 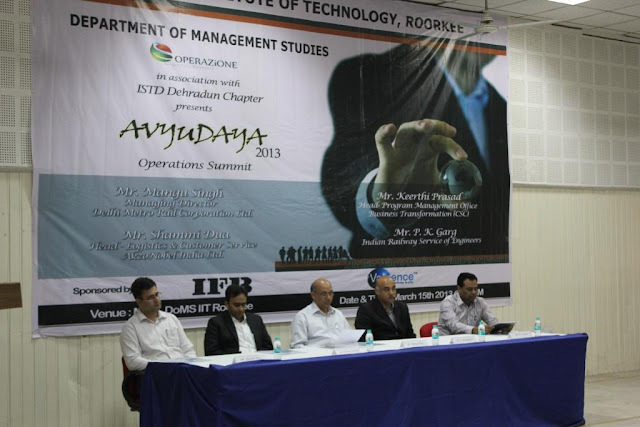 After this a panel discussion was conducted where all the eminent speakers shared their understanding. The discussion was very fruitful and enriched the knowledge of the students. This marked the end of the event. A note of thanks was delivered and a token of gratitude was presented for their time. The session was much enjoyed by the students. It was a very important event not only about operation management but also for various other business functions and proved successful in achieving its goal.